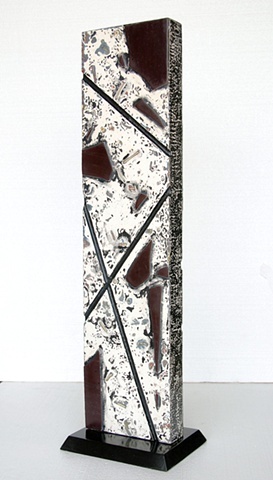 Delos Van Earl Studios - "Black Tie Stele"
42" X 3" X 10"
Black geometric lines and dark burgundy glass on a creamy white background with gray and black dappling on a painted black wooden base. An elegant freestanding piece. "Black Tie Stele" is available.